Rebuilding from the ruins of Yolanda | Solid Group Inc. It all started out as a simple but meaningful gesture of giving back or generosity. To lend a hand in the rehabilitation efforts following the destruction wrought by Typhoon Yolanda (Haiyan) on November 8, 2013, the Chairman Emeritus of the Solid Group Inc, Attorney Elena S. Lim, spearheaded a project to build twenty-seven units of twin classrooms (fifty-four in total) in several devastated areas. Attorney Lim grew up in Tacloban and walked its streets before being forced out by a fire that consumed half of Tacloban. The project was her way of giving back and helping her former city mates. Solid Group Inc (SGI) holdings company ordered the modular classrooms from Yahgee Modular House Ltd of China. Yahgee is the world’s largest manufacturer of modular and pre-fab structures and is the partner of Solid Group Technologies Corp or My|House (a subsidiary of SGI). The modular structures use prefabricated insulated sandwich panels technology. They can withstand winds of up to 230 kilometers an hour and earthquakes of up to intensity. The modular units can be assembled and disassembled up to six times. One month is 3enough to build two classrooms. Learning that the units ordered were for the victims of Typhoon Yolanda, Yahgee gave a big discount to SGI to lower the costs of the latter. On November 2013, the materials were shipped to the Philippines via Cebu. It proved to be a costly exercise as a huge backlog developed in Cebu due to the heavy influx of relief goods and materials from many external organizations and donation groups. Cebu port and Customs were not equipped to handle this surge and this soon developed into a bottleneck. The goods were released partially in December 2013 and fully transferred to Mandaue warehouse by early January 2014. This was due to a large extent to the intervention of Mr Jason Lim who arranged to expedite the release and transfer of the materials. Construction went full swing 3rd week of January 2014. Efforts were hampered by lack of cement, temperature bars, gravel and sand, and in some cases, by lack of back fill materials. But, by the grace of God, and the solid determination of everyone involved (from management til the contractors teams), construction pushed through and was finished by end February 2014. All sites were done and divided among three teams of contractors working simultaneously. The chairs and tables were handled by another supplier and came in just before the inaugural turnover and blessing. On March 20, 2014, Atty Elena Sen Lim, Mrs Maria Isabel Ongpin (friend of Mrs Lim), Mr Jason Lim and Rudolph Panlilio and Jingo Fermin (My|House team) flew to Tacloban to symbolically turn-over the 54 classrooms to the people of Tacloban and Ormoc City. Present at the turnover rites were officials from both the national and local governments and the seven school principals of the recipient schools. Overall, it was a long, exhausting but very fruitful journey from conception to construction. 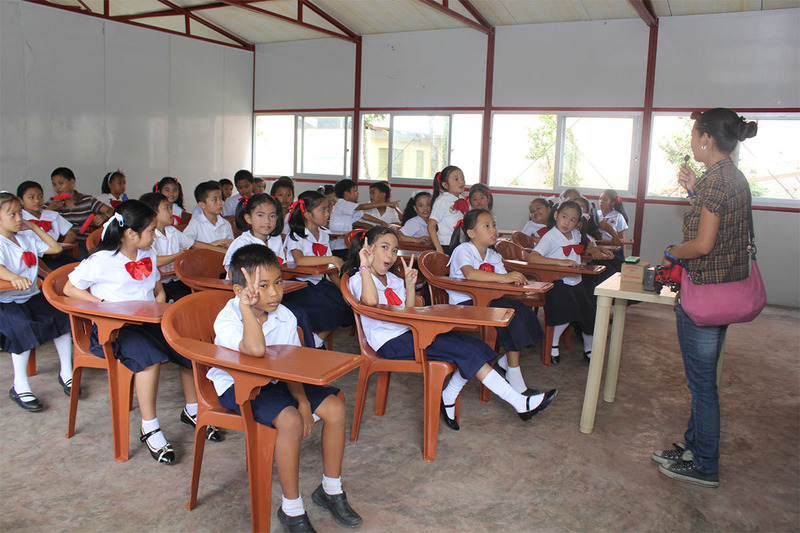 As Vice Mayor Yaokasin puts it: “No words can capture how grateful the people of Tacloban are for these donated classrooms. It was worth the wait.” Fitting words for a journey that began with a simple step of reaching out. Written by Jingo Fermin, president of Solid Group Technologies Corporation (My|House).